Baby shower games. Some love them some not so much. 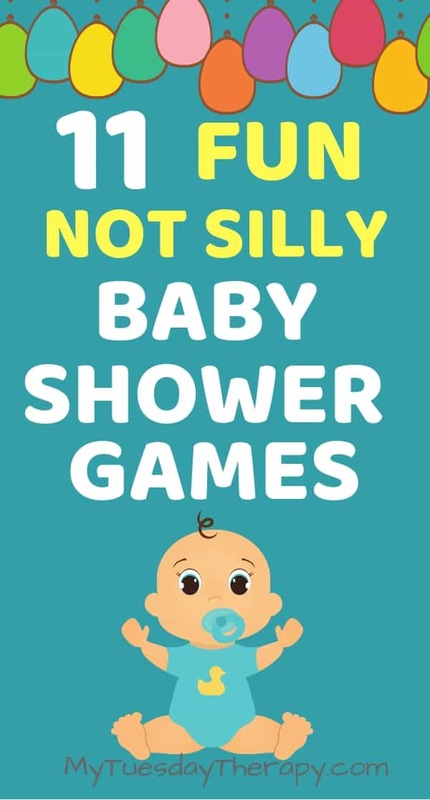 The easy baby shower games in this article will entertain also those who are not so big on the “dirty diaper” type of games. 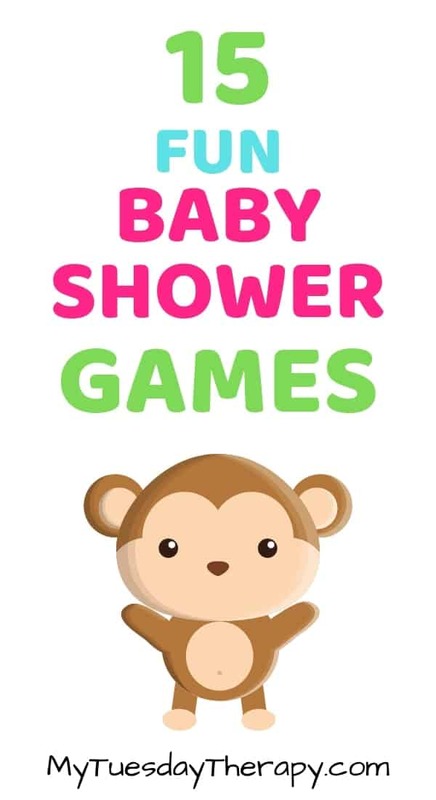 In additions to this awesome collection of baby shower games I have another post filled with cheap baby shower games. We all…almost all(?) love emojis! And nursery rhymes aren’t too bad either. This would be a cute way to entertain the baby shower guests. 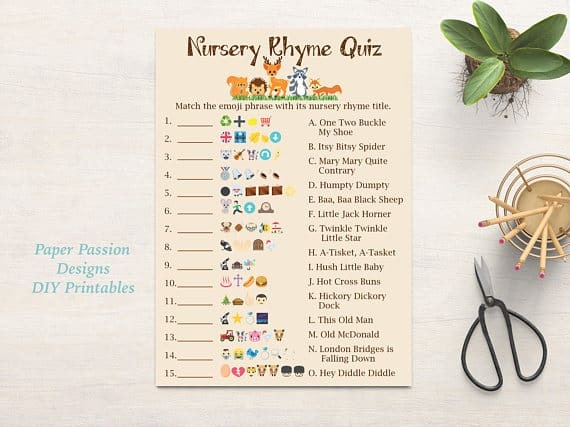 If you don’t have time to make your own how about checking out this Emoji Nursery Rhyme Quiz with woodland animals from Paper Passion Designs. This silver themed nursery rhyme quiz from Damla Digital can be little harder unless you really know your rhymes. The game can always be made a little more difficult by timing it. Another cute emoji baby shower game. 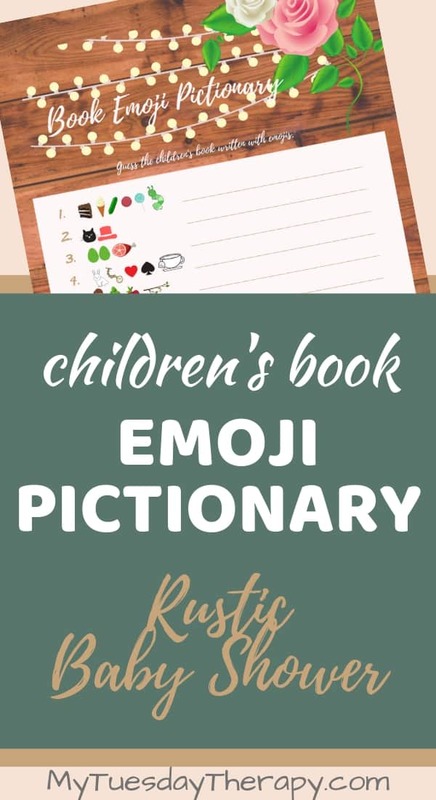 In this one the guests will figure out the book titles based on emojis. 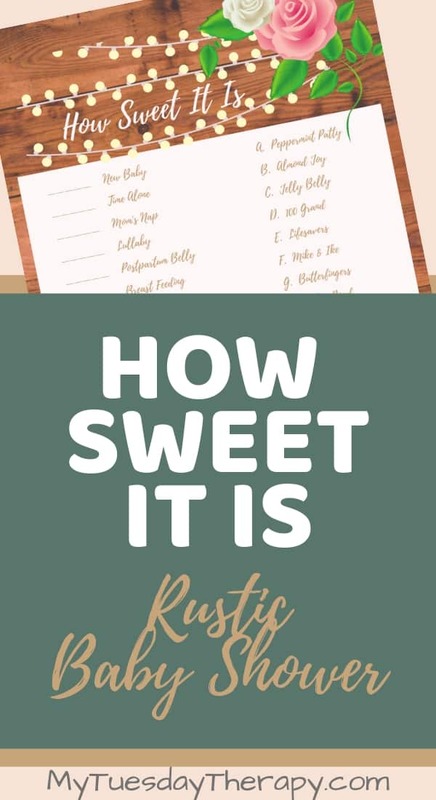 A fun rustic baby shower game collection from My Tuesday Therapy contains 9 awesome baby shower games. Place various baby items in a paper bag or a box that has a small hole cut in the side. Give each guest a certain amount like 25 seconds to feel the items. Then they will write down what they felt. The one who has most correct wins. And the mom-to-be gets to keep all the fun baby items! I’m sure we all have at some point played this simple game of passing a gift to left or right based on the story read. This cute printable is from the Party Stork. All you need is the left right story and a wrapped gift. Read the story. Whoever is holding the gift will pass it to the left or right whenever she hears one of those words. This game is so easy and an excellent ice breaker. Your guests will be giggling at the story while passing the gift around. You’ll need several pictures of mom-to-be at different ages. Place the pictures on a wall or table in random order. Label the pictures with numbers. You could also copy the images on a paper sheet in random order. Ask the guests to put them in correct order. Give an extra point for knowing the exact age. A fun alternative to What’s In Your Purse Game. The game is simple. The guests earn points for things in their phones. Make your own or purchase one of the many options. There is one to match pretty much any baby shower theme. You’ll have lots of laughter with this candy match baby shower game from Ivree Monroe Creative. The guest will have a great time figuring out which candy matches with contractions, which one is for the sleepless nights and so on. Set a time limit to make it more challenging. Perhaps the winner could receive a basket filled with the candies mentioned in the game. Whether you know how to draw or not this is a game that will make you all laugh together. 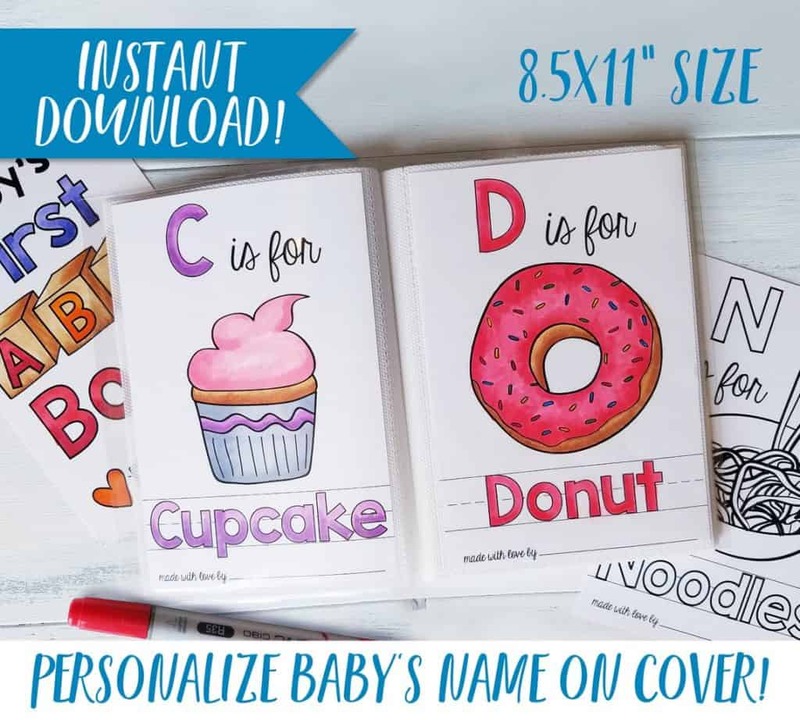 Make it easy on yourself and purchase this set of Baby Shower Pictionary Words (72) from And All the Above. You could also do this the telestrations style! That would be hilarious! Write down baby related sentences on index cards. Each player picks one and makes a drawing in a notebook according the sentence. Then she passes the notebook to the next person. This player will write down what she sees in the drawing and passes the notebook to the next player. This person now draws what the previous person wrote down and so on. Put together a playlist of kids songs and lullabies. Play each a short amount of time and ask the guests to identify it. One point for knowing the song title two points for naming the artist. This game can be played the way that everyone writes down the answer and whoever has most correct wins or that the first one to know each tune gets a point, the one with most points wins. 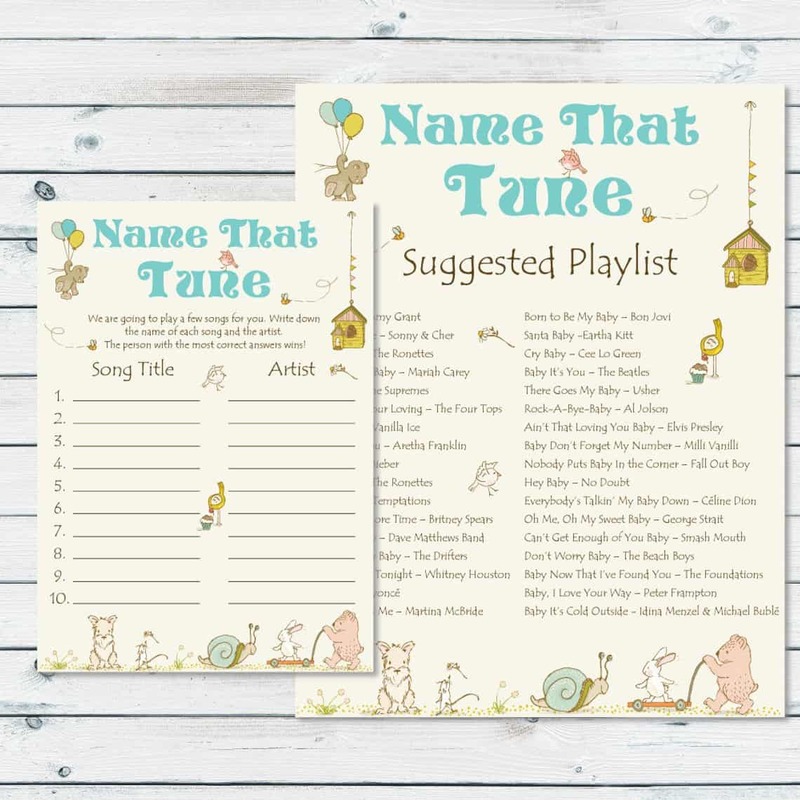 Graphic Wisp Prints brings you a cute storybook printable for Name That Tune game. They also include a suggested playlist to save you time. You can also buy a lovely Name That Tune printable from Draw Me A Party. This simple greenery design goes well with any baby shower theme for boys or girls. Another cute printable baby shower game is Name That “Baby” Song from Hello Baby Papiere. In this game the guests fill in the missing words for a selection of popular songs that have the word “baby” in them. This version does not strain your brain as much. This game is one of the most common games played in baby showers I’ve attended. It’s always a great ice breaker. As the guests arrive, give each a diaper pin or a clothes pin. Once everyone has arrived instruct them not to say the word “baby”. Or pick another word such as the baby’s name or the mom’s name. If anyone hears someone else to say the forbidden word she can take the pin from her. At the end of the game, the person with the most pins wins. This game always brings smiles on everyone’s face. Even those who are not artistic will find this game entertaining. Give everyone a paper plate and a pen. Ask them to hold the plate on their heads while drawing. You could simply ask them to draw a baby or make it more complicated and describe the nursery one item at a time they need to draw (draw a crib, a rocking chair next to the crib, a dresser, a teddy bear in the crib, a pillow on the rocking chair etc. Besides needing a ton of diapers the mom-to-be will need a stack of burp cloths. This wonderful idea to create a burp cloth decorating station is from A + Life. A fun alternative to onesies decorating station. 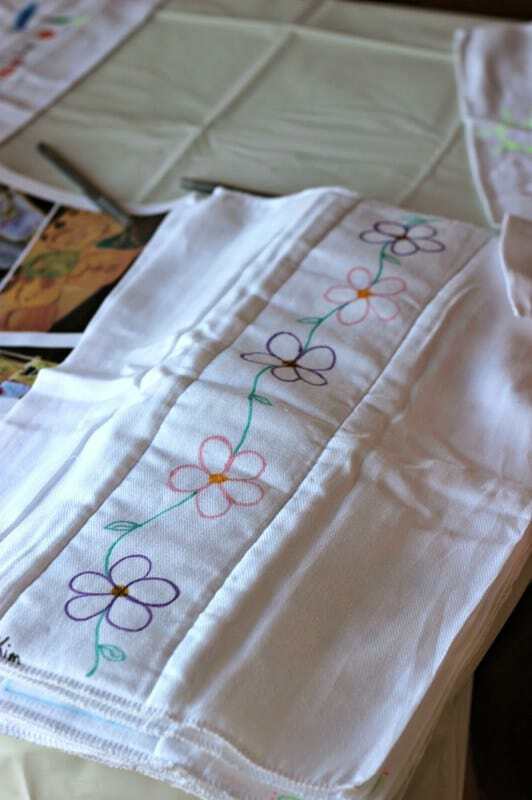 The guests will have a great time writing messages or making pretty drawings on this cloths. Another creative activity that will be fun for your guests and serves as a cute decor for the baby’s room. Buy wooden letters, markers, paint, buttons etc. and ask the guests to decorate them. Perhaps you can spell out the baby’s name or a cute phrase. This game is one of the easiest ones. All you need is a jar and something to fill it with. Well… you’ll need also paper slips and a pen. Usually the winner gets to keep the jar full of goodies. But if you fill it with pacifiers or socks the mom to be would be happy to get a jar full of the cutest baby socks. And the winner of the game could get a pair of fuzzy socks. Or another inexpensive baby shower favor. Prepare or buy sugar cookies in the shape that goes with your theme. The guests decorate cookies while talking and getting to know each other. The cookies can be for the mom-to-be or they can be used as a party favor. If baking cookies is not your things you can order Sugar Cookies To Decorate from Country Side Cakes. They have hundreds of options for shapes so you can find something that goes with your unique baby shower theme. These cookies come also in three different flavors! Some… not me… like to perform. This would be a perfect way for those gifted in performing arts to shower the mom-to-be in a very special way. If you need help coming up with the words Family Friendly Poems has a big selection of poems about babies, pregnancy, family, moms etc. Another lovely way to entertain the mom-to-be and the guests is by asking someone to sing a special song to the mom. Speeches can be awesome and so touching. And the speech does not need to be sentimental it can be funny too. Making this book will be loads of fun! The mom to be will have many laughs while reading all the hilarious things the guests write in this book. Of course, you can also write good solid advice too. 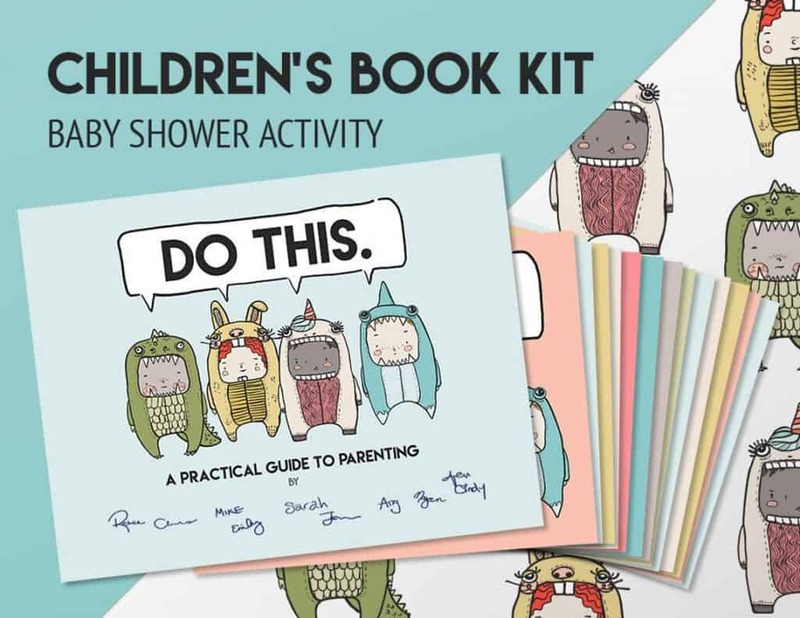 Get your Book Kit from Handwritten Book Co.
Coming up with hilarious advice on spot can be hard but coloring this cool Baby’s First ABC Book is not! This baby shower activity is easy. Everyone knows how to color. The baby will enjoy looking at the pretty pictures while mom reads it to him and talks about the people who made this book with love. Hosting a baby shower is such an honor and I hope that these game and activity ideas will make the shower very special. You’ll find more game ideas in Cheap Baby Shower Ideas.